This past weekend must have been an eight-year-old boy’s dream. 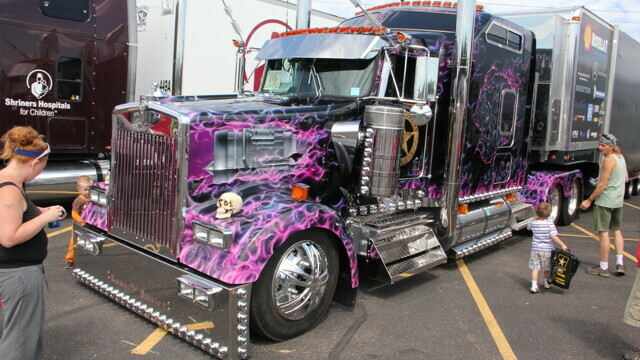 With both Big Rigs and Barnstormers making their way around Eau Claire at the same time, the excitement of flashy paint jobs and big engines was a little contagious to even an otherwise unexcitable adult. While taking in the Big Rig Truck Show in the CVTC parking lot, one could simply look up to see the American Barnstormer Tour’s vintage airplanes zooming overhead on their way in and out of the Chippewa Valley Regional Airport. While I wasn’t able to get to the Barnstormer Tour up close, I certainly caught a dozen or more glimpses of the old birds slicing through air all over town. And while I technically didn’t attend the Big Rig show either, I did take in their parade down State Street. In fact, a friend lives right on State and planned a whole cookout around the event. A dozen adults and their kids, aged six months to six years, all piled on blankets in the front yard at dusk to take in the chrome pageantry of dozens of huge tricked-out trucks with crazy paint jobs and more lights than you thought could possibly be mounted on one vehicle. With a less-than-harmonious chorus of horns slowly tooting their way down the street, the wind picking up and a storm cloud just overhead, it made for an unusually exciting little evening. At least for the eight-year-old in me.